Vacation rental house. 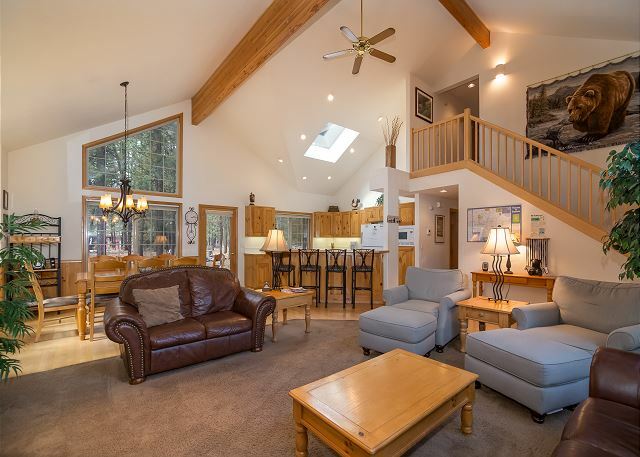 Sleeps 14, 5 bedrooms, 3.5 bathrooms. No pets allowed. 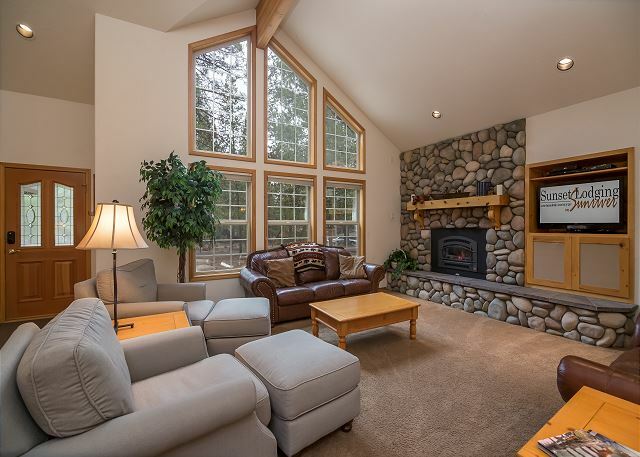 Escape to Sunriver while staying in this luxurious lodge style, 5 bedroom with bonus room, 2 master suites and 3.5 bath dream vacation home. Enjoy the central location of Mt. Hood #12 by taking one of the six cruiser bikes on a short bike ride to the SHARC pools (12 Unlimited passes), Fort Rock Park or the Deschutes River. Mt. 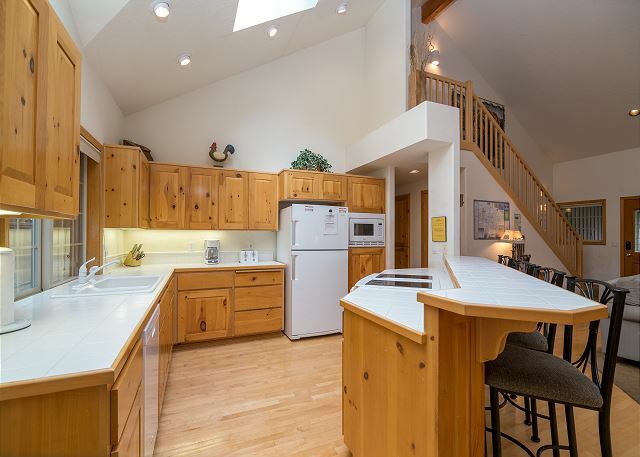 Hood #12 is a popular and perfect destination for multi-family get-aways of up to 14 guests! 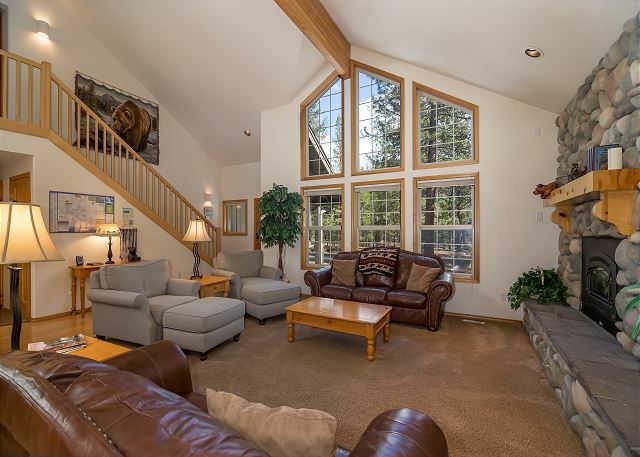 Relax in style after a long day of skiing, biking, or swimming in the hot tub or while watching your favorite movie on the 60 inch flat screen TV. 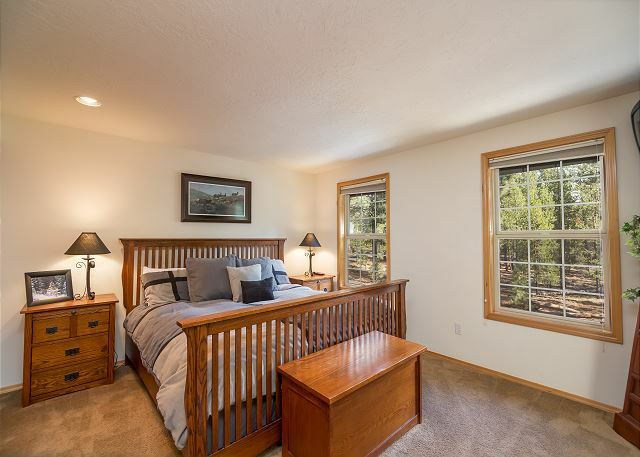 You'll then sleep soundly atop one of the two brand NEW King beds ( Jan 2019) , one Queen, two Twins, two sets of bunks, or Queen sofa sleeper located in the bonus room. Entertain via the fully stocked kitchen while overlooking the vaulted dining and living rooms that include another flat screen TV, Blue Ray player, an MP3/CD stereo player and a rock fireplace to warm up by with those favorite people in your life! Additional comforts that make Mt. 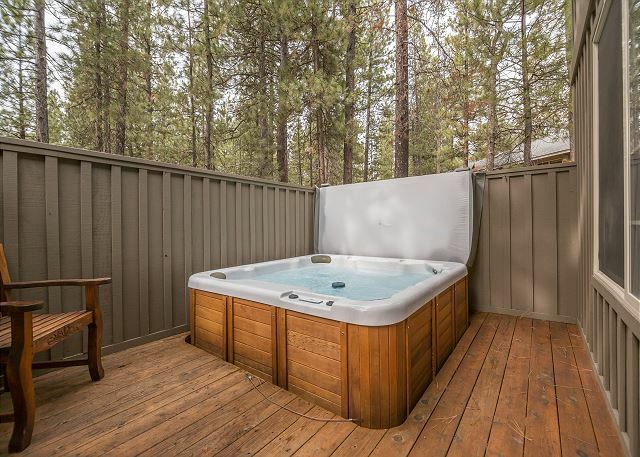 Hood #12 that special Sunriver vacation home include: a relaxing jetted tub in the main floor master, a foosball table in the bonus room, outdoor grilling and meals using the gas BBQ and deck furniture surrounded by beautiful pine trees. Two burly/child bike trailers and a baby jogger make exploring Sunriver's 30 miles of pathways with those brand new Sunriver guests a joy! 2 Kings, 1 Queen, 2 Twins, 2 Sets of bunks (one is a twin/double), 1 Queen sofa bed, ports-crib, 3 flat screen TVs. 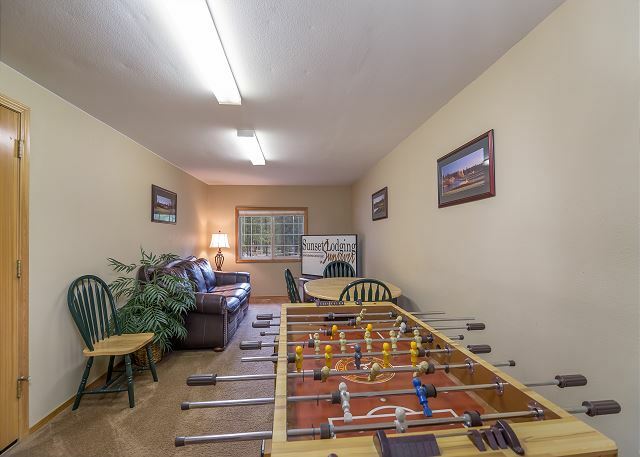 1 TV in upstairs master, 2 Blue Ray players, 1 DVD player, 2 MP3 players, CD/Stereo player, D/W, W/D, microwave, gas fireplace, 2 master suites, jetted tub, bonus room w/ foosball table, 7 bikes w/ w child's bike trailers, baby jogger/stroller, 1 pack-n-play, 1 high chair, garage "drink" fridge, hot tub, 2 levels, gas BBQ, lodge style home, near Ft. Rock Park and SHARC. 2643 Sq. Ft., 5 Star, 12 Unlimited SHARC passes. Nice house, clean, laid out nicely, well equipped. Our family had a wonderful time visiting, playing games, and exploring Sunriver. This is a great house for large groups! Thank You for the 5 star review, Elaine! We are delighted to hear that you had a wonderful family gathering in this great home! Come back Soon! We had a great time-again! The people from Sunset Reality are very helpful with the few things we needed to make our stay even better! The property was described accurately. We appreciate having things for the little ones. We enjoy pickleball,biking,floating down the river,having ice cream and of course the SHARC. Thank you Mary for your generous review! Our family owned business appreciates families like yours that have a great time in Sunriver and think our team is special. We think you are special too!! Can't wait to help you again for next Summer! It was clean and cozy. Great amenities as well! Thank You for your review Ryan! Glad you enjoyed your stay at Mt Hood 12. We hope to see you again in Sunriver! Nice well equipped property! They even had sugar for our coffee! The little stuff matters. We’ll come back. Thank you for your stay and review of Mt. Hood 12. We're glad you enjoyed your stay and that you appreciate the little things. We look forward to welcoming you back to Sunriver soon! Sunset Reality was very helpful and efficient. We only had an issue or two,and they were right on it. The house was well stocked for our grandkids- bikes, high chairs,port-crib, booster and bike carriers for the little ones. The bikes were nice and we were able to ride everywhere! Our family really enjoyed this house. 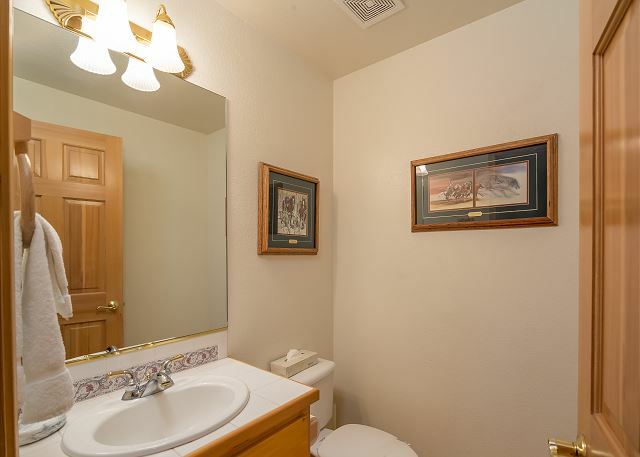 We had done VRBO before- last year had a bad experience, and decided to go local. Very glad we did! Used the SHARC passes every day! Plan on staying again! We're glad you enjoyed your stay Mary and appreciate your review! We would love to help you anytime so you do not have to go through the hassle or pay the extra fee's of VRBO. Hope to see you soon! Our family getaway was great! Our family stayed at Mt. Hood #12 this past President's Day weekend. We all had a wonderful time. 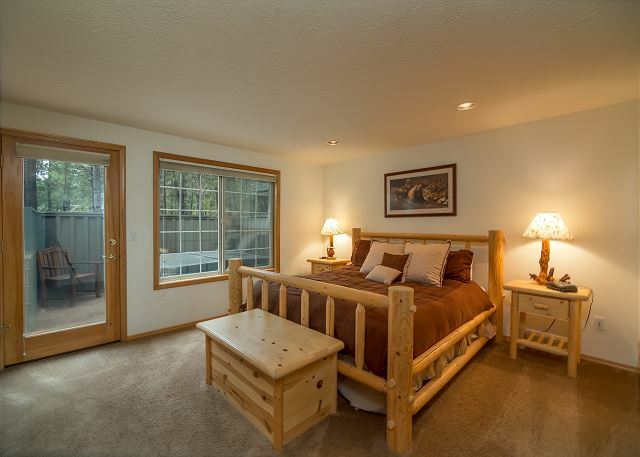 The home was all that was advertised and the assistance we received from Sunset Lodging was exceptional. 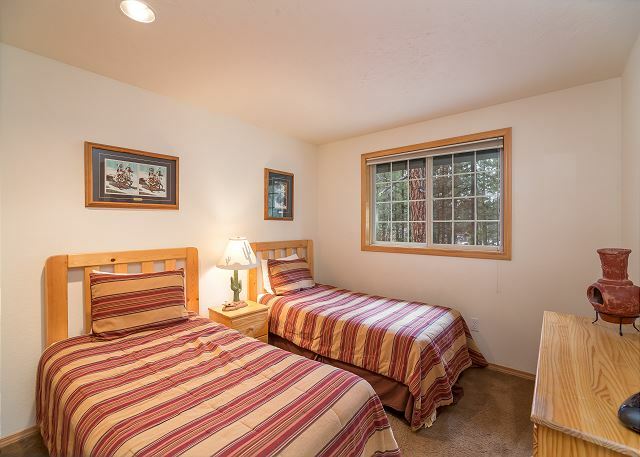 We would highly recommend both this property and the folks at Sunset Lodging. Thanks so much for the wonderful review Gary! We truly appreciate it! Mt. 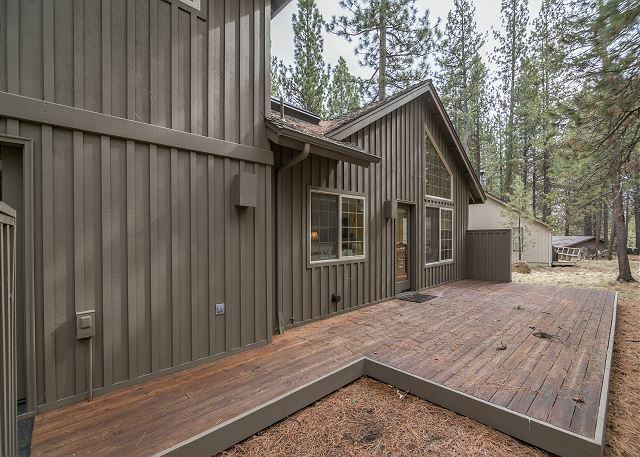 Hood 12 is a great property and one of our favorites. Please come visit us again soon! 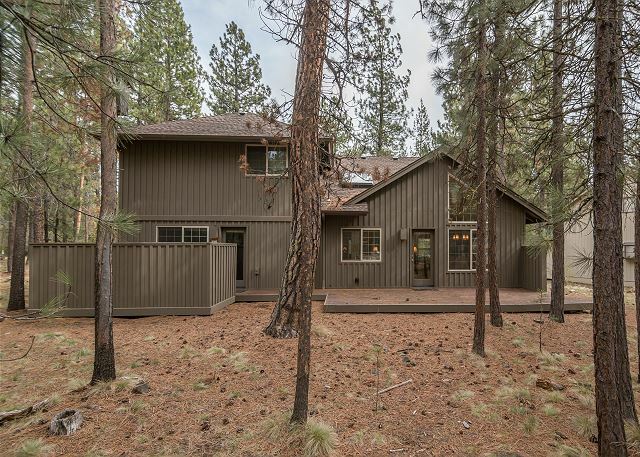 We have been coming to Sunriver for almost 30 years and as our family expands we need larger homes. This house was perfect for all nine of us! It is a bit of a walk to the mall or lodge but the trials make it enjoyable. A great holiday was had by all!! We are always so glad to see folks having a nice time in Mt. Hood 12, Janet! The owners of this home work tirelessly to be sure their guests are comfortable and happy. 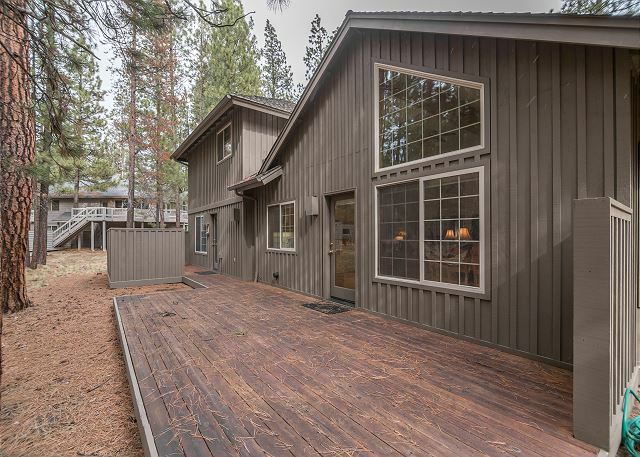 Long time guests like you are TREASURES and we hope to get the chance to host you and your expanding family in Sunriver for many years to come. The exterior of the house is great. Nice back patio and hottub. Many bikes to choose from. Fantastic location. Cleanliness I gave two stars. The livingroom chairs are very used and dirty looking so we barely used them. The bedding too isn't the nicest, very used looking, beds were poorly made, which made us question the cleanliness a bit. A few items scattered around- pan with note on it, bunched up mat in the middle of the carpeted hallway (assuming it was supposed to be placed in front of kitchen sink? ), garbage full outside. A broken window upstairs and another broken window blinds in master. Granted, when I contacted the rental company, they were very responsive and quick to offer assistance. I am glad we could offer quick service, Corey. And I am sorry you had a few issues while you were visiting Mount Hood 12. I have notified our maintenance department and we will address the housekeeping issues as well. We are always happy to come out and 'reclean' anything that is not up to your standards as we don't want even one minute of your vacation to be spent pondering housekeeping issues. Thanks so much for your feedback and we hope you'll get back to Sunriver soon. Overall a really great experience. 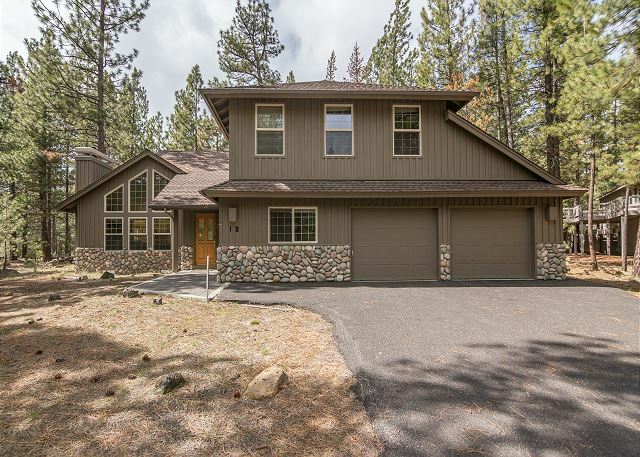 #12 Mt Hood Lane is a great house in a great location. The house was clean but there was a leftover urine odor in all the bathrooms. The house has great amenities but the living room chairs were soiled and saggy and the mattresses in the bunk room were not comfortable. 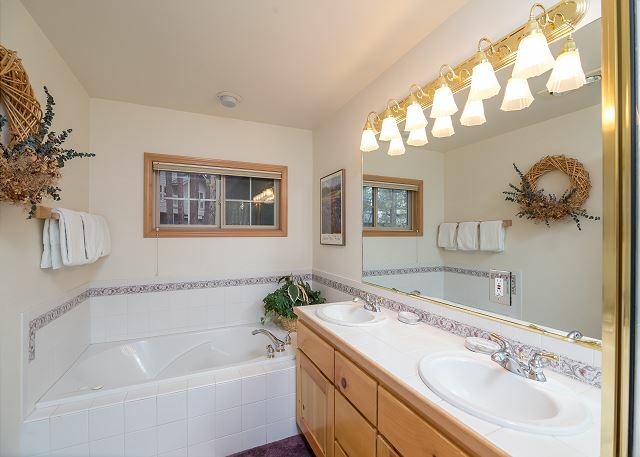 They should toss the little rug in front of the kitchen sink - ugly and a tripping hazard. None of those things were too important. We had a good time! Thanks for this feedback Patricia! We appreciate our guests' point of view. We'll take a look at those mattresses and the rug in the off season. Furniture gets deep cleaned then too, but if you ever have a situation where there is dirty ANYthing, please let us know so we can come out and at least spot clean it for you so you are comfortable. 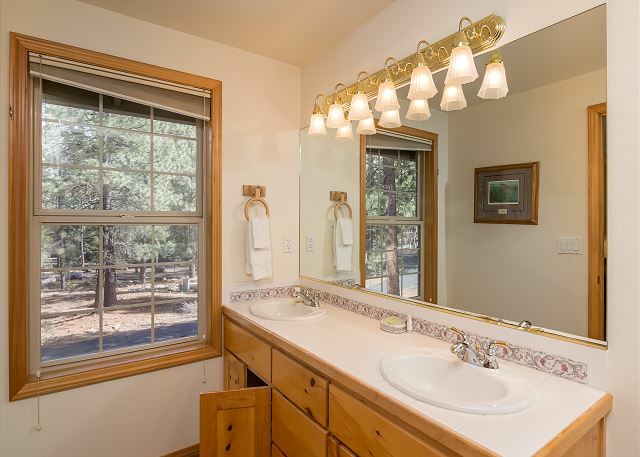 The busy summer in Sunriver does not allow us to deep clean between guests, so we are always fully prepared to spot clean whenever necessary. We are VERY glad that you enjoyed Mount Hood 12 overall, it is a very popular home in our program and we sure hope to have you back there again soon. Thanks again for your feedback and for your business, we are so grateful. 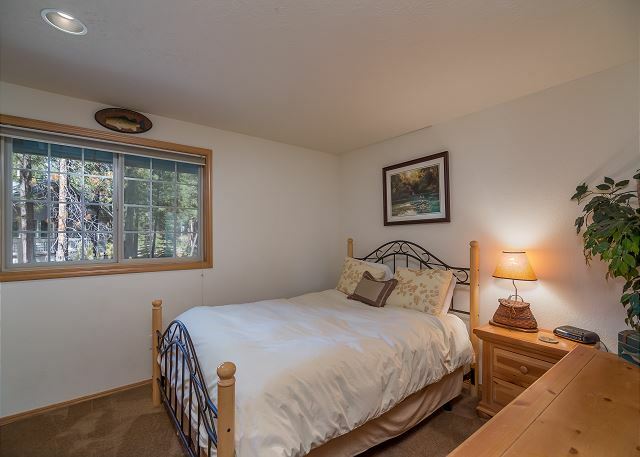 Great location, close to the village, great size and had 12 Sharc passes, however, the property is showing age, especially dinning room chairs, living room furniture and cabinets, etc.. BBQ was very old and difficult to start. There were only five chairs on deck for a 5 bedroom home. Thanks for your feedback, Dennis! We hope to get the chance to host you in Sunriver again soon. We liked the house and especially the number of bedrooms and beds and bathrooms. The bonus room was great. The dryer needs to be repaired or replaced because it takes 2 long full cycles to dry anything.The remotes for the TV's were mixed up and needed new batteries.Some of the furniture in the living room was quite old. There is only 1 small table with 5 chairs on the back deck. That is not enough for such a large house that accommodates 14 people. There should be another table and chairs and maybe a couple chaise chairs. We did really like the open floor plan and all the windows and skylights for a lot of light. I would stay there again. Thank you for your feedback Galeen, we hope to host you again at Mount Hood 12 soon! We enjoyed the home very much. The location was great and was close to SHARC and short distance to the village. The only things that I think could be improved is the hide a bed was uncomfortable and the children slept on the floor instead. No AC. The fan on the furance was not enough for upstairs. The fans were not enough. The BBQ is in bad shape and should be replaced. We would stay again but not in the hottest season. Thanks Kurt! Come back soon! The house had everything we needed in order to keep our whole family comfortable, busy, and happy. We were in the perfect location, so we parked our car for the full stay and used the provided bikes to get to and from everywhere- SHARK, Village, Horses, ect. It was especially nice to have SHARK passes since that was a regular visit during our stay. In addition, we loved having the huge hot tub on the deck plus a BBQ. You could tell this is a loved home and the owner's want the renters happy. Wow! What a great compliment, Sean! Thanks kindly for your feedback, we are always so glad to match great guests in great homes. Mount Hood 12 is a crowd-pleaser to be certain. We hope you'll get back to Sunriver soon. We had a fabulous time in Sunriver! The house was great and worked well for our family of 10 (6 adults and 4 kids). We used the SHARC passes which were awesome and appreciated having bikes and helmets available, much more fun and convenient than having to rent. Unfortunately, I didn't notice on the website that there wasn't AC. That only became an issue in the evenings (my fault, not the house). My only other suggestion would be that the bed in the downstairs MB really needs to be replaced, it sags has no support, very uncomfortable (hence, the #3 on general condition). Otherwise a great house for us!! This is great feedback, Lisa - thank you so much! We'll take a look at that bed in the off season with the owners. They are VERY attentive to this kind of thing. Thank you again and we hope you'll get back to Sunriver soon. My family truly enjoyed our stay here. Everything we could have needed was in the house. We had a blast and would highly recommend this house to others. Wow, Breann! Thank you so much! We are always elated to hear this from our guests! We hope you can get back to Sunriver soon, we'll keep the place sunny and beautiful for you in the meantime! We had a wonderful vacation week with our whole family. This has become a yearly tradition and as usual we had a great time! This home allowed everyone to have their own space and was quite spacious. Sharon - this is really, REALLY good news for us! As a family run business, we want our guest families to have the utmost comfort and convenience from their rental homes so that they can focus on family time. We're so glad Mt. Hood 12 and Sunset Lodging delivered for the Shopes! We hope the yearly tradition spans over generations. See you next year, unless perhaps we can entice you into a winter wonderland getaway? I brought our high school basketball team for a team building weekend. There were nine players and two coaches - and more than enough space and beds to go around. The house is beautiful, very comfortable accommodations. Great variety of pots, pans, plates, silverware - was pretty much like cooking at home. Would highly recommend staying here! We are glad you enjoyed your stay at Mount Hood #12! This home is a great getaway! Thank you for choosing Sunset Lodging, we hope you come back soon for another visit! 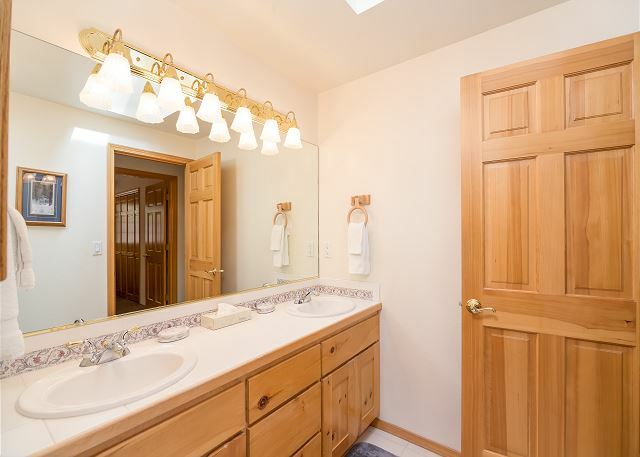 Thank you for your feedback on this home! Worked out very well for our family group of 14. The house is great. It's beautiful and comfortable and had just about everything you could need. We took full advantage of the sharc passes and there were bikes fit everyone. Even a stroller and high chair for our baby. Basically we're ready to go back and just move in. Thank you for the wonderful review! 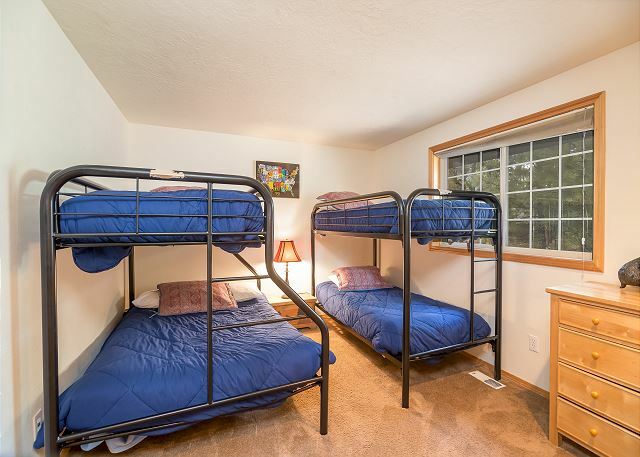 We are happy to hear that you felt so comfortable and at home, and that you felt that Mt Hood 12 was so well appointed! We hope that we will see you again soon!